Here are a few items, in my closet (or recently purchased, bag being the oldest from last fall!) that I've been 'loving lately'! My valentine did get me that bracelet, he is amazing! Two dresses for vacation, so necessary! And finally some new make-up! For this make-up challenged girl, these have been great additions for me. NARS Tinted moisturizer, evens out my skin tone more than the light power (that never lasts all day) I have been using for years, and has even more SPF than my daily moisturizer - gotta keep the face protected! And I've been loving this bronzer, blush, highlighter combo! I was going to just replace my bronzer but this kept calling my name! 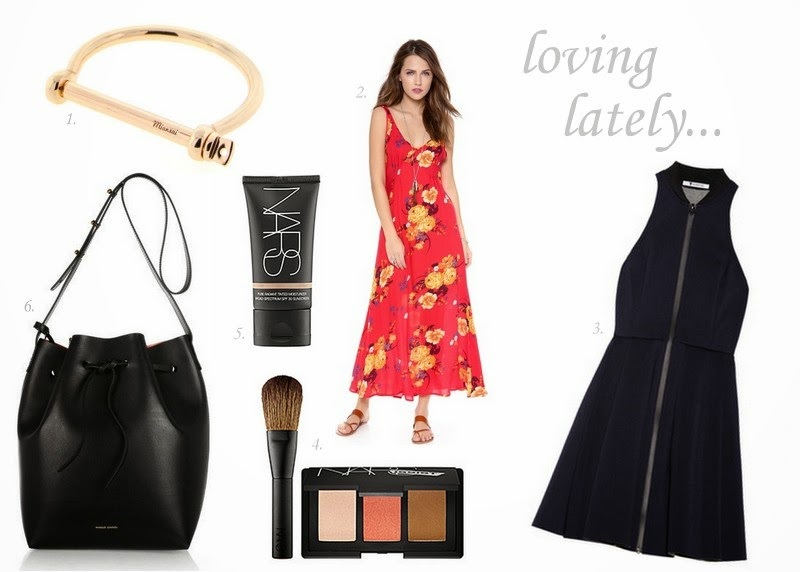 What have you been loving lately (or purchased)? Still loving that bag ! I'll take that bracelet please! Gorgeous!